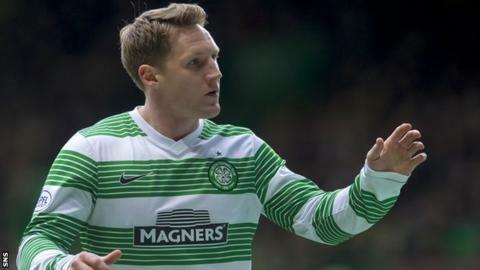 Kris Commons is in no rush to enter talks about extending his contract with Celtic while welcoming the prospect of a long-term deal with the champions. The midfielder is one of three Celtic players named in the four-man shortlist for PFA Scotland player of the year. And Celtic are preparing to trigger a one-year extension to his current deal. "I don't really want to be saying what should be happening," said Commons. "I think it just rolls into the 12 months. There is no rush to get sitting down." Commons, who has scored 27 goals this season from an attacking midfield position, joined team-mates Virgil van Dijk and Fraser Forster on the PFA Scotland Premiership player of the year shortlist along with Kilmarnock striker Kris Boyd. The 30-year-old is reportedly interesting Leicester City as they prepare for promotion to the Premier League in England. But, while Celtic manager Neil Lennon has spoken of his desire to tie up the former Derby County, Nottingham Forest and Scotland player, Commons revealed there had been no talks. "Obviously if someone offered me a three-year deal you would think 'that's me settled, I can get my kids in nursery' and you can start thinking about buying houses and stuff like that," he admitted. "But I'm a player, I get paid to play football, not to dictate how much money I'm going to get and the length of the contract. "That's down to the club, 'This is what you're getting, sign or not'." When asked whether he saw himself finishing his career at Celtic, the 30-year-old said: "I really don't know. I'd hope to play until 35-36, but everyone knows in football, as soon as you are not wanted, they are quick to shoo you out the door. "It's vitally important for me to stay fit, keep playing well, keep scoring goals and hopefully we'll have a lot more big nights at Celtic Park." Despite his goalscoring exploits, Commons believes this season has not been his best for the club. "Goals to games ratio, yes, but I feel I played a lot better when I first came in and last year," he said. "But when you're scoring goals then people take note. "I always try to get double figures, attacking midfielders always try to get double figures. "But to be close to 30, I never dreamed of doing that. It's probably a one-off, but I look to get on the scoresheet every week now." Commons evaded a question on whether he would end his self-imposed Scotland exile if Gordon Strachan asked him. The Celtic midfielder maintained that quitting international football had helped his club form and said: "I don't see Gordon ringing me up any time soon. "He seems to be doing all right without me."